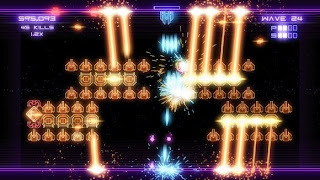 For those of you that stuck around (I warned you), Crossfire is your standard Space Invaders/Galaxian style shooter. On crack. And speed. And a lot of meth. While drinking. And eating two dozen Krispy Kremes. I trust you get the point. Gameplay seems pretty standard at first as you'll move left and right, shoot things above you, and dodge whatever they shoot in your direction. So, pretty normal...until you hit a shoulder button and warp to the other side of the screen, shooting down from above the enemies. These enemies, in turn, will flip around and start firing upward, and you'll find yourself not only watching the bullets on your side of the screen but also on the other side so you don't warp right into enemy fire. If that's all that there was to the game, it'd be a decent distraction but nothing amazing. However, your enemies become diverse very quickly. They'll start off with pretty simple turrets that flip when you do but as the game goes on you'll see ones that flip at different intervals, shoot both ways, shoot diagonally, fire constant beams, explode into a wave of bullets when shot, reflect your bullets from one side, or are just there to shield the other enemies. It's amazing how well these different enemy units combine to make each of the fifty levels feel different than each one before it, forcing you to do more than just shoot a bunch and hope for the best. You'll have to shoot and run, time warps carefully, make sure you're picking off shields without having other units reflect your bullets back at you, and so on and so forth to the point where it's quickly just as much strategy as it is reflexes and manic firing. The visuals of Crossfire take a pretty large and neon light-filled page out of the Geometry Wars book of graphic design, but this isn't a bad thing considering you'll want each incoming bullet to announce itself loudly. No matter how much the neon wireframe look got played out over the last five years, the fact of the matter is that it's so well done and fitting here that you won't care and really won't even notice. It's like a bed you've slept in for five years. Comfortable, familiar, broken in but does the job nicely, and something you aren't embarrassed to show your date as long as you wash the sheets...hmm, maybe that metaphor wasn't perfect after all. Anyway, it looks great, and there isn't a bit of slowdown regardless of how hectic things get. The music also borrows from the Geometry Wars bible with a single energetic tune that somehow never gets tiring no matter how long you play. If you remember the controls for Space Invaders, you'll need to know a whopping two more buttons for this for the game's warp feature (via any shoulder button) and for the refillable rapid fire (done with the X button). There's nothing about the controls I can find fault with, and I don't mean a simple "they work" by that. The ship never feels too fast or too slow, even after your speed upgrades throughout the course of the game. The sheer level of polish that went into the simple movement and shooting fills me with nerd-glee just thinking about it. After four playthroughs of the game's 50 waves across its two difficulty levels and more than a few tries with the game's endless Megawave mode, in addition to some multiplayer, there wasn't a single fault I could find with the game outside of a lack of online leaderboards. Albeit that's a huge minus since that's one of the things that can extend the replay value of a game like this through the roof, but with a game that's literally flawless otherwise I can't stay angry about that for more than a few seconds. The level of polish along with the sheer amount of good old-fashioned arcade present here is better than a lot of XBLA titles and is something I'd gladly pay XBLA price for instead of the mere 240 MSP as an XBLIG title. If you're a fan of arcade-style ship-shooting eye-melting fun, there's no reason for you to pass this up. radiangames Crossfire from, uh, radiangames is available on XBox Live for 240 MSP. Played through Normal and Turbo modes, tried Megawave on each, played through most of the game with a second player, and will eagerly purchase any game from this company day one from here on out.